As a stepping stone helping you get started in Omada EAPs, this article introduces how to choose an optimal management method in your situation, and the setup steps of each method. There are several essential considerations when looking for the optimal methods, from your network size to the management tools. This part helps you select the best management methods for your needs. For the detailed steps of each management method, refer to the Part 2: How to Manage EAPs with Different Management Methods in this article. Omada EAPs support two configuration modes: Controller Mode and Standalone Mode. The following comparison chart clarifies the notable features of the two modes. Controller Mode is the preferred method for centrally managing mass EAPs in a large-scale wireless network. Controller Mode provides an all-in-one and super convenient solution for EAPs configurations and maintenance. With Cloud Access enabled, you can log in to the controller at any place. And you can view the AP devices, clients, statistics, insights, logs. Some advanced functions like customizing the facebook portal and monitoring the system topology on a map are only supported in Controller Mode, which are frequently used in a large-scale network. In Controller Mode, all EAPs can be centrally configured and monitored via a software controller (Omada Software Controller) or a hardware controller (Omada Cloud Controller OC200). For how to determine the controller type, see here to get help. Standalone Mode is designed for singly managing a small number of EAPs in a relatively small-sized wireless network. This mode is recommended for users who want to control their APs right away without taking the time to configure a controller, which can simplify the process. In Standalone Mode, each EAP can be configured by the Omada app or the management web page. For detailed information about the configuration steps, see here to get help. Tailored to your needs and budget, choose an Omada Software Controller or an Omada Cloud Controller (OC200) to configure your EAPs in Controller Mode. The following comparison chart clarifies the notable features of Software Controller and OC200. Omada Software Controller is a free management software for TP-Link EAP devices. With this software hosted on the computer of your network, you can configure EAPs in batches and conduct real-time monitoring of EAPs locally or remotely through Omada Cloud service. Omada Software Controller is required to be running for the devices to use advanced functions like Voucher portal. So the downside is additional considerations and expense for the computer’s continuous work. The Omada Cloud Controller (OC200) is the management device which is pre-installed with the Omada Software Controller 3.0.2 or above. You just need to pay for the OC200, then the built-in Omada Controller software is free to use, no license fee or extra cost required. With the small size as a mobile phone which does not take much space, OC200 is easy to deploy and install. The suited management interface depends on what kind of management device you use. On a PC, you can use a web browser. Both Controller Mode and Standalone Mode support login with a web browser. In Controller Mode, the Mozilla Firefox, Google Chrome, Opera and Microsoft Internet are supported. We recommend that you use the latest version of browser to manage Omada Controller. On a mobile phone, you can use the Omada app. There are versions for iOS and Android, available for free on the App Store and Google Play. With Omada app, You can monitor your network or make quick configuration adjustments when you are on the go. Follow the steps to set up your EAP via Omada app in Standalone Mode. 1. Launch the Apple App Store (iOS) or Google Play store (Android) and search “TP-Link Omada” or simply scan the QR code to download and install the app. 2. Connect your mobile device to the EAP by using the SSID of the EAP (the default SSID is printed on the label at the bottom of the EAP in the format of TP-Link 2.4GHz/5GHz_XXXXXX). 3. Launch the Omada app, tap Standalone APs and wait for the EAP device to be discovered. Tap on the EAP device appearing on the page. Set a new username and password for your login account of the EAP. Follow the steps to set up your EAPs via a web browser. 1. Connect wirelessly by using the SSID of the EAP (the default SSID is printed on the label at the bottom of the EAP in the format of TP-Link 2.4GHz/5GHz_XXXXXX). 2. Launch a web browser and enter http://tplinkeap.net in the address bar. Use admin for both Username and Password to log in. 3. Set up a new Username and Password for secure management purpose. Modify the wireless parameters and reconnect your wireless devices to the new wireless network. You can watch the following video to learn how to configure the EAP single via a web browser. Follow the steps to set up your EAPs using Software Controller. 1. On the PC with Windows OS or Linux OS, download the Omada Controller installation file from TP-Link official website. 2. Run the file and follow the wizard to install the Omada Controller. 3. Launch the Omada Controller and follow the step-by-step instructions to complete the Quick Setup. After the wizard is finished, a login screen will appear. 4. Enter the username and password you created and click Log in. Then you can further configure the Omada Controller. Follow the steps to set up your EAPs using OC200. 1. Deploy OC200 on your network and power it on. Make sure that your management device and OC200 are on the same subnet. 2. Check the DHCP server (typically a router) for OC200’s IP address. 3. Launch a web browser and type OC200’s IP address in the address bar, then press Enter (Windows) or Return (Mac). 4. Launch the OC200 and follow the step-by-step instructions to complete the configuration wizard. This video will demonstrate how to set up the OC200 via a web browser. 1. Enable Cloud Access on the controller software or OC200. 2. Make sure that your management device and the controller (the OC200 device or the host installed with Omada Controller software) can access the internet. 3. Launch a web browser and type https://omada.tplinkcloud.com in the address bar, then press Enter (Windows) or Return (Mac). Enter your TP-Link ID and password to log in. 4. The configurations between the Software Controller and OC200 is are slightly different. For Software Controller, a list of Omada Software Controller that has been bound with your TP-Link ID will appear. Click Launch to visit the web management interface of your controller software. For OC200, enter your TP-Link ID and password to log in. Then click Add Cloud Controller and follow the instructions to add your OC200. Click Launch to visit the web management interface of OC200. 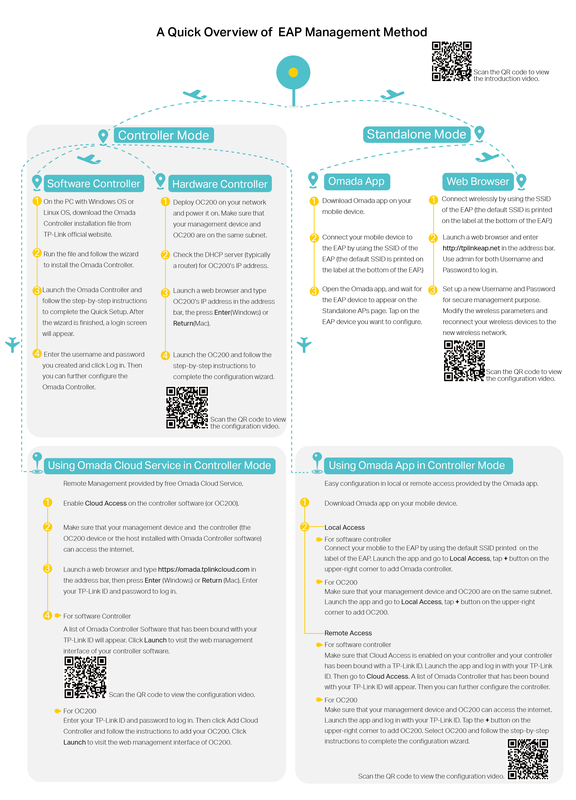 To understand how to use Omada Cloud Service, you can refer to the following video. First, you need to download Omada app on your mobile device from the the Apple App Store (iOS) or Google Play store (Android). Search “TP-Link Omada” or simply scan the QR code to download and install the app. For Software Controller, connect your mobile to the EAP by using the default SSID printed on the label of the EAP. Launch the app and go to Local Access, tap + button on the upper-right corner to add Omada controller. For OC200, make sure that your management device and OC200 are on the same subnet. Launch the app and go to Local Access, tap + button on the upper-right corner to add OC200. For Software Controller, make sure that Cloud Access is enabled on your controller and your controller has been bound with a TP-Link ID. Launch the app and log in with your TP-Link ID. Then go to Cloud Access. A list of Omada Controller that has been bound with your TP-Link ID will appear. Then you can further configure the controller. For OC200, make sure that your management device and OC200 can access the internet. Launch the app and log in with your TP-Link ID. Tap the + button on the upper-right corner to add OC200. Select OC200 and follow the step-by-step instructions to complete the configuration wizard. This video will demonstrate how to set up the OC200 via your mobile phone. The following picture gives a quick overall information of the methods for managing Omada EAPs. You can scan the related QR code to open the corresponding configuration videos. More videos about managing EAPs via Omada App and OC200 will be published in the near future, which will introduce all the management methods. You are welcome to leave your suggestions for new videos in the post to improve our work. For more detailed introductions of the EAP and controller, you can visit https://www.tp-link.com/support to download the configuration guide in the download center.